Linnaea are hardy perennial subshrubs that are native to woodlands. They have small evergreen leaves and carry pink or white fragrant bell shaped twin flowers from the end of spring through to the early summer. They are ideal plants to grow in a shady part of a rock garden. A common name for the Linnaea plant is Twin Flowers / Twinflower. 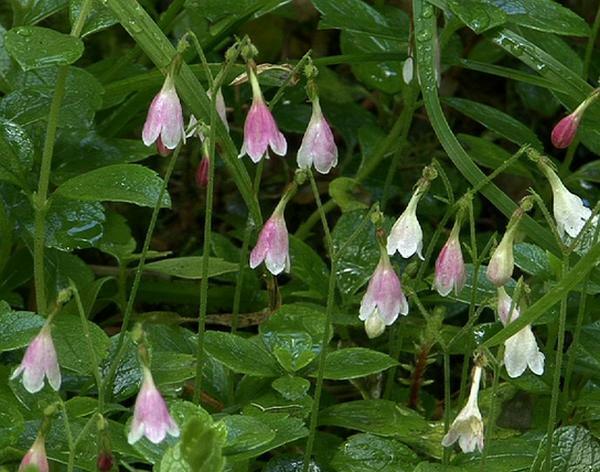 Linnaea borealis photograph by Mount Rainier NPS. Height: 8 to 16 inches (20 to 40 cm). Prostrate. Growing Region: Zones 1 to 5. Flower Details: White, pink. Paired. Bell-shaped. Fragrant. Foliage: Evergreen. Oval. Small. Opposite. 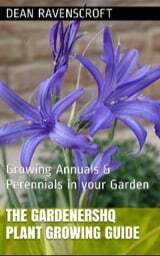 Growing Outside: Usually grown from cuttings, divided plants or nursery bought plants. Seed: Cover. Late summer to early autumn; use fresh seeds. Spacing 12 inches (30 cm). Transplant outdoors following the last frost or in autumn. Seeds should be sown into flats. Next sink the flat into the ground in an area that offers shade, preferably close to a wall that faces north. Provide a glass/plastic covering. Keep an eye on the flats to ensure that the soil remains moist and to check if seedlings have emerged. Transplant the seedlings to their final location as they emerge. Requirements and care: Full or partial shade. Soil pH 4.0 to 5.5. Moist soil, sandy soil, peaty soil. Regular watering to maintain a moist soil. Propagate: by dividing or by taking cuttings in the spring. Miscellaneous: Named after the Swedish scientist Carl Linnaeus. Traditionally used by native Americans as a tea. It is best to grow twin flowers outdoors from seeds. They should be sown into flats in a shaded part of the garden and covered in glass. It can take a very long time (years) for Linnaea plants to germinate, so it may be better to buy plants from a garden center (Twin Flowers are easier to propagate from established plants). If/when you manage to get the Linnaea plant seedlings to grow in a flat, then transplant them in either spring or summer into a shady part of the garden, that has a peaty wood soil and is very acidic (pH 4 to 5) that is moist. Once growing it is important to ensure that twin flowers always have moist soil to grow in, so water frequently to stop from drying out. If you require more plants then Linnaea can be divided in the spring or root cuttings can be took.